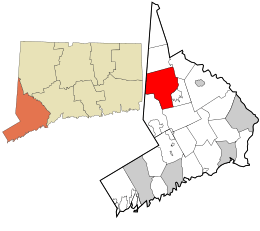 Danbury is a city in northern Fairfield County, Connecticut, United States, approximately 70 miles from New York City. Danbury's population at the 2010 census was 80,893. Danbury is the fourth most populous city in Fairfield County, and seventh among Connecticut cities. The city is located within the New York metropolitan area. The city is named for Danbury, England, the place of origin of many of its early settlers. It is nicknamed the Hat City because of its prominent history in the hat industry. The mineral danburite is named for Danbury. 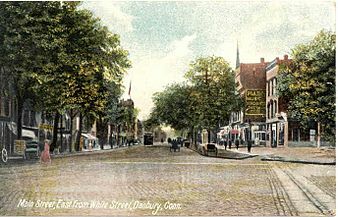 Danbury was settled by colonists in 1685, when eight families moved from what are now Norwalk and Stamford, Connecticut. The Danbury area was then called Pahquioque by its namesake, the Pahquioque Native Americans. One of the original settlers was Samuel Benedict, who bought land from the Paquioques in 1685, along with his brother James Benedict, James Beebe, and Judah Gregory. 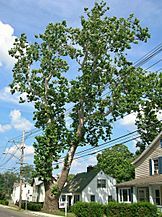 Also called Paquiack ("open plain" or "cleared land") by local Native Americans, the settlers chose the name Swampfield for their town, but in October 1687, the general court decreed the name Danbury. The general court appointed a committee to lay out the boundaries of the new town. A survey was made in 1693, and a formal town patent was granted in 1702. During the American Revolution, Danbury was an important military supply depot for the Continental Army. On April 26, 1777, the British, under Major General William Tryon, burned and looted the city. The central motto on the seal of the City of Danbury is Restituimus (Latin for "We have restored"), a reference to the destruction caused by the Loyalist army troops. The American General David Wooster was mortally wounded at the Battle of Ridgefield by the same British forces which had attacked Danbury. He is buried in Danbury's Wooster Cemetery; the private Wooster School in Danbury also was named in his honor. In 1835, the Connecticut Legislature granted a rail charter to the Fairfield County Railroad, which saw no construction as investment was slow. In 1850, the organization's plans were scaled back, and renamed the Danbury and Norwalk Railroad. Work moved quickly on the 23 mi (37 km) railroad line. 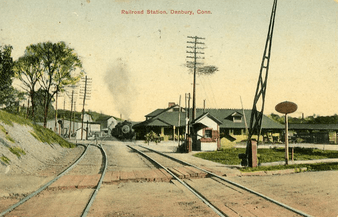 In 1852, it, the first railroad line in Danbury, opened, with two trains making the 75-minute trip to Norwalk. 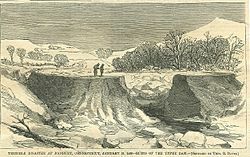 The dam impounding the Kohanza Reservoir, one of many reservoirs built to provide water to the hat factories, broke on January 31, 1869. The ensuing flood of icy water killed 11 people within 30 minutes, and caused major damage to homes and farms. Oglala Sioux tribesman Albert Afraid of Hawk died on June 29, 1900 in Danbury during a tour with Buffalo Bill's Wild West Show at age 21. His interment was at Wooster Cemetery. Afraid of Hawk's remains were discovered by Robert Young, an employee of Wooster one hundred and twelve years later. His remains, covered in a bison skin, were relocated to Saint Mark's Episcopal Cemetery near Manderson, S.D. for reburial by tribal descendants. A 60-acre (24 ha) tract near the Fairgrounds, known as Tucker's Field, was purchased by local pilots in 1928 and leased to the town. This became an airport, which is now Danbury Municipal Airport (ICAO: KDXR). On August 18-19, 1955, the Still River, which normally meandered slowly through downtown Danbury, overflowed its banks when Hurricane Diane hit the area, dropping 6 inches of rain on the city. This was in addition to the 9 inches that fell from Hurricane Connie five days earlier. The water flooded stores, factories and homes along the river from North Street to Beaver Brook, causing $3 million in damages. Stores downtown on White Street between Main and Maple were especially hard hit. On October 13-16, another 12 inches of rain fell on Danbury, causing the worst flooding in the City’s history. This time, the Still River damaged all bridges across it, effectively cutting the city in half for several days. Flooding was more widespread than in August, and the same downtown areas hit in August were devastated once again. The resulting damage was valued at $6 million, and two people lost their lives. The City determined the river in the downtown area had to be tamed. $4.5 million in federal and state funding were acquired as part of a greater urban renewal project to straighten, deepen, widen, and enclose the river in a concrete channel through the downtown. At the same time, roads were relocated and rebuilt, 123 major buildings were razed and 104 families were relocated. This began various efforts by the City through 1975 towards urban renewal, using another $22 million of federal funding. However, these efforts failed to reinvigorate the central business district. In 1780, what is traditionally considered to be the first hat shop in Danbury was established by Zadoc Benedict (although hat making existed in Danbury before the Revolution); it had 3 employees, and made 18 hats weekly. By 1800, Danbury was producing 20,000 hats annually, more than anywhere else in the U.S. Due to the fur felt hat coming back into style for men and increasing mechanization in the 1850s, by 1859 hat production in Danbury had risen to 1.5 million annually. By 1887, thirty factories were producing 5 million hats per year. Around this time, fur processing was separated from hat manufacturing when the P. Robinson Fur Cutting Company (1884) on Oil Mill Road and the White Brothers' factory began operation. By 1880, workers had unionized, beginning decades of labor unrest. Lockouts and strikes plagued the industry, affecting the economy of the entire town. In 1893, nineteen manufacturers locked out 4000 union hatters. In 1902, the American Federation of Labor union called for a nationwide boycott of a Danbury non-union hat manufacturer, Dietrich Loewe. The manufacturer sued the union under the Sherman Antitrust Act for unlawfully restraining trade. The U.S. Supreme Court, in 1908, held that the union was liable for damages. This also is known as the Danbury Hatters' case. In the '30's and '40's there were a number of violent incidents during several strikes, mostly involving scab workers. Beginning in 1892, the industry was revolutionized when the large hat factories began to shift to manufacturing unfinished hat bodies only, and supplying them to smaller hat shops for finishing. 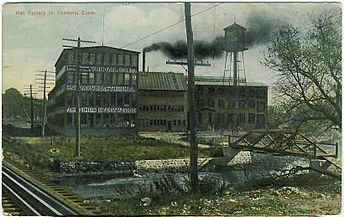 So while Danbury produced 24% of America's hats in 1904, the city supplied the industry with 75% of its hat bodies. 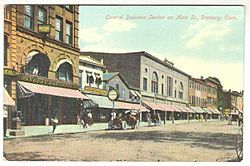 The turn of the century was the heyday of the hatting industry in Danbury, when it became known as the "Hat City" and the "Hatting Capitol of the World". Its motto was "Danbury Crowns Them All". But by the 1920s, the hat industry was in decline, and by 1923, only six manufacturers were left in Danbury. After WWII, returning GI's went hatless, a trend that accelerated through the 1950s, dooming the city's hat industry. The city's last major hat factory, owned by Stetson, closed in 1964. The last hat was made in Danbury in 1987 when a small factory owned by Stetson closed. 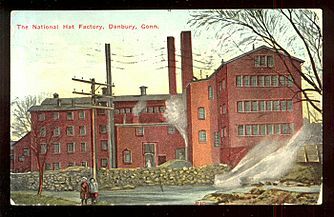 During the Second World War, Danbury's federal prison was one of many sites used for the incarceration of conscientious objectors. One in six inmates in the United States' federal prisons was a conscientious objector, and prisons like Danbury found themselves suddenly filled with large numbers of highly educated men skilled in social activism. Due to the activism of inmates within the prison, and local laborers protesting in solidarity with the conscientious objectors, Danbury became one of the nation's first prisons to desegregate its inmates. According to the United States Census Bureau, Danbury has a total area of 44.3 square miles (115 km2), of which 42.1 square miles (109 km2) is land and 2.2 square miles (5.7 km2), or 4.94%, is water. The City is located in the foothills of the Berkshire Mountains on low-lying land just south of Candlewood Lake (the City includes the southern parts of the lake). Danbury borders Ridgefield to the southwest, Redding to the south, Bethel to the southeast, Brookfield to the northeast, New Fairfield to the north, and Southeast, New York to the west. The City's terrain includes rolling hills and not-very-tall mountains to the west and northwest called the Western Highland. Ground elevations in the City range from 378 feet to 1,050 feet above sea level. The Still River flows generally from west to east through Danbury. The hat making fur removal process is known to be the source of serious pollution by mercury nitrate dumped into the Still River during the time of hat production in the late 19th century, which then flowed into the Housatonic River and Long Island Sound. It is estimated that the population of Danbury as of 2015 is 84,657. As of the census of 2010, there were 80,893 people and 29,046 households in the City, with 2.73 persons per household. 44.1% of the population spoke a language other than English at home. The population density was 1,921.4 people per square mile. There were 31,154 housing units at an average density of 740.0 per square mile. The racial makeup of the city was 68.2% White, 25.0% Hispanic or Latino, 7.2% African American, 0.40% Native American, 6.8% Asian, less than 0.10% Pacific Islander, 7.6% from other races, and 4.5% from two or more races. 32% of the population was foreign born. However, a new FHL Danbury team called the Danbury Titans was approved for the 2015–16 season, owned by local car dealership owner Bruce Bennett. As part of the approval of the new Danbury team, he took over the Stateline/Danbury market and created the Brewster Bulldogs instead of the Whalers (the Bulldogs folded after one season). The Danbury Hatters Cricket Club formed in 2001 and has been playing cricket in Southern Connecticut along with other cities such as Norwalk, Stamford, Bridgeport, New Haven, Waterbury and West Haven. The Western Connecticut Militia is a semi-professional football team that joined the New England Football League in 2011. The team plays its home games in Danbury at both Danbury High School and Immaculate High School. Danbury, Connecticut Facts for Kids. Kiddle Encyclopedia.